Since 2011, we’ve kept track of and postulated the shift in the trend colours for furniture. The fashion and furniture industries call the flavour of the times ‘trend colours’ simply because these are the tones that will harmonise the aesthetics for the year. Generally, trend colours emerge out of a study of the human condition at that point in time. Sentiment, the various things people buy, use and wear, the cycle of contrast, the influence of weather, and more. Manufacturers oft influence changes as well, and the case with furniture is a bit of both. Trend colours are more often temporal than culture changers, and they can affect furniture production as a whole, since adopting them calls for more varied inventory, sourcing and alterations in production routines. The year saw a progression of the colours of the last 2 years. Last year, white was a base and the new colours existed merely to add life. The accent trend colours now have bceome much more. From accessories and smaller pieces of furniture, to larger interior elements such as walls and fixed furniture everything carries these tones. These are then, the 3 colours that made it big in Milan2013; we have no doubt that these will continue for another 2 years, with the addition of a darker tone to build the inevitable colour contrast cycle. BLUE is back, and was strongly evident at not just Salone and Design Week, but also in fashion. Last season, we saw the push for turquoise and aquamarine, and hence the advent today of clearer blues is but natural. As the primary trend colour, leather and fabric upholstery, accessories of all sizes and shapes, carpets and even new innovations sport various shades of blue. Sky blue and baby blue are the key tones. Blue is both warmth and positivity. Says the legendary Pasquale Natuzzi, “I personally believe that blue will come back as a lasting colour trend in interior design. Blue is very important for us as people - it means the blue sky, water and the soul.” Giusseppe Nicoletti believes that while light blue is the new boy in town, pastels will dominate. A closer look at the fair reveals that several manufacturers did indeed produce furniture and accessories with a range of pastel tones. DEEP YELLOW-MUSTARD. The vibrant golden yellow tone and its darker cousin are the main relief colours of the year, as they were in 2012. Much upholstery, foil coverings and plastics today sport the tone in not small quantities. The tone is used to add life to not only new styles, but also to designs that are well established. Mirroring the sentiment prevailing in Europe, we beleive that while the colour brings brightness to a grey market, it also represents energy - to do new things with vigour. LIME GREEN or CHARTREUSE is the third critical tone for the year. While it has been in vogue for a while, the tone is still important today since it indicates an affinity towards the environment. For the last 15 years, the Milan Furniture Fair has hosted the SaloneSatellite - a grand expose of young design and creativity. Designers are chosen from all over the world to present their innovations, not necessarily related to interiors or furniture. While some are design students still in university, others are designers who’ve already begun their professional journeys. From thousands of applications just a few are picked. The year’s theme was “design and craftsmanship: together for industry”, with a clear attempt to stimulate the passion for deeper involvement in the development of concepts. At the end of the week, a dozen or so go back with a SaloneSatellite Award, and a lucky handful would have bagged a contract from a major manufacturer. Delhi-based Rohit Kumar is one of two Indians at SaloneSatellite. A NIFT graduate, Rohit had two pieces on display at his booth. One was a study table that is colourful and highly utilitarian, with extraordinary smart storage, and using wood, glass and leather. The other was shortlisted for the awards. Inspired by the structure of the beehive, the ‘hive-jacked’ lounge chair uses polypropylene sandwiched between layers of felt. The unusual design, seen here, is all about abstraction in a symmetrical, curved, free-flowing form. One entire section at SaloneSatellite was devoted to the important processes that define how well a design thought is brought to reality. The idea - to create visibility for those who work the materials behind the scenes, and encourage dialogue between master craftsmen and young designers. This was wonderfully manifested in four fully equipped concept workshops at location - Wood, Metal, Glass and Digital, managed by masters in their fields. Beyond Object is a collection by the London-based Poetic Lab and Studio Shikai. The governing idea in all their work is light being used in ways that blur the boundaries of physicality. The ‘Shadow Clock’, shown here, uses intangible shadows to describe time, giving it a philosophical and poetic sense. A concealed, completely unhindered light source creates shadows of the hands of the clock in such a way that the mechanism appears ethereal and organic, taking on the texture of the wall it sits on. A graduate from the IUAV Venice, the charming Alessandra Meacci is an interior designer, architect and product designer. Her collection on display was structured around the idea of folding metal in unusual ways, allowing for a creative inter-play with light. The main concept on display in her booth was a dynamic system of folded metal elements, inspired by the shapes of wings, which, when brought around a light source, create a dream-like effect on the surroundings. The key is that these individual pieces can be put together in interesting ways. Meacci’s booth was a display piece in itself, with lights and a tree in a mixed plan structure. made it to awards shortlist. Crafted entirely from bamboo veneer, the pendant light fixture is robust and lightweight, and can be easily flat packed. The design theme of the lamp is a beehive. Linacre is part of the Melbourne Movement - a talented mix of young Australian designers. The movement was founded by Kjell Grant in 1999. Mumbai-based Komal Vasa, showcased two exhibits - Mandala and Mansara. Mandala is an experiential device - an enclosed light installation signifying the balance between a person’s macrocosm and microcosm. Optics captures the images outside and fuse them with the quiet inner sanctum. Mansara, shortlisted for the awards, is a metal, wood and slumped glass cabinet. Within the inner realm, the rhythm of a bird is captured in a plastic expression central to the piece. QuartzD, a group of young Japanese designers, presented Qone. Designed to bring relaxation and relief, the idea uses paper layers that envelop you softly to create a private space, while light filters through. The standout installation was one of a kind at the SaloneSatellite. New Yorker Danielle Trofe’s sustainable approach to furniture and lighting design led her to ‘Live Screen’ - a vertical hydroponic garden in a modular structure with a self-watering system. The design is environmentally sound, allows for herbs and vegetables to be grown indoors, and is also an aesthetic addition in any room. Satoshi Yanagisawa’s Re_ exhibition is an attempt to combine new-age production and materials with local craftsmanship, with the aim of enabling sustainability in design. OLED lights, worked into novel forms such as this circular table lamp, were just one of the displays in the booth. Another was Otto, a smart, seamless power strip. This concept cabinet by Utopia Architecture and Design, China, is a truly special design. Creativity comes to the fore in this truly exciting piece that exploits the Fibonacci sequence. Break it down, build it up - the assembly of ratios define the arrangement and shape of the cabinet. Made out of wood, and with four slanted legs, each box allows for demarcated storage while presenting a visual singularity when unified. The SaloneSatellite Awards are very prestigious, and can change the fortunes of a young designer overnight. This year, Tania de Cruz won the first prize. Her use of cork to create heat-insulating and sound-proofing modular panels demonstrated how 100% natural materials can be used in a novel way to provide a design solution that’s not only sustainable but also extraordinarily aesthetic. The Salone Internazionale del Mobile, the International Furnishing Accessories Exhibition, SaloneSatellite, the biennial Euroluce Lighting Exhibition and SaloneUfficio are collectively called ‘iSaloni’. This, the 52nd edition, had over 2,500 Italian and foreign exhibitors, occupying an area of nearly 230,000 square metres at the new Milan Fairgrounds in Rho. It is a big leap from what it used to be back in 1961, when Cosmit, the company that organises Fair, was launched by a small coalition of furniture manufacturers to promote the export of Italian furniture. Back then, in 1961, the Fair covered just 12,000 sqm and had 12,000 visitors. 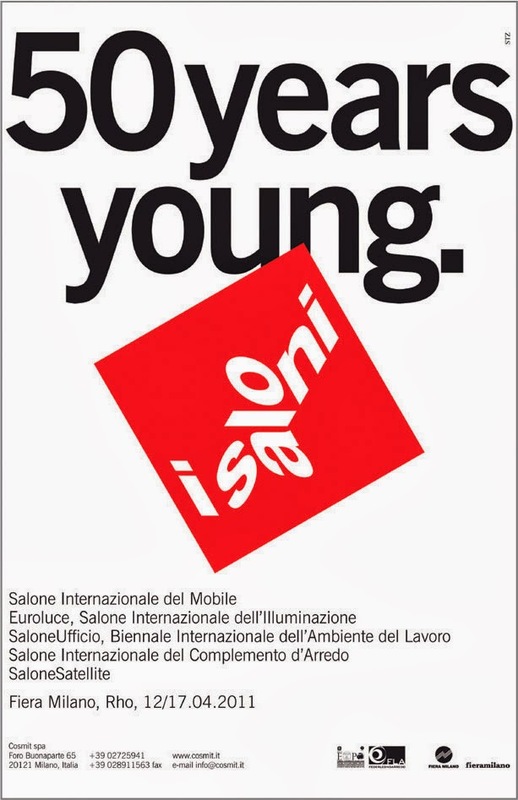 The Salone quickly proved itself to be an excellent marketing vehicle for a highly fragmented industry, first becoming an international event in 1967. To mark its 30th anniversary, it was rescheduled from September to April. Over time, it has become the world’s most significant furniture design event, with manufacturers from all over the globe using it to enhance their business and reach. New trends and concepts are unveiled and created, and those that seek to define the industry get an equal opportunity to establish themselves.